Is it so wrong to want to revel in good water news a bit? After enduring more than 19 years of lingering drought in the Southwest and its implications for the Colorado River system, we think not. This month, Congress has passed, and the President has signed into law, the Colorado River Drought Contingency Plan Authorization Act, which permits the Secretary of the Interior to sign a DCP agreement with the Seven Basin States. Considering the very serious potential consequences of Lake Mead water levels falling to critically low levels, that is truly something worthy of celebration. So, too, was the remarkable bipartisanship and leadership on display among the Arizona congressional delegation, which led the DCP effort in in both the House and Senate. On top of that, hydrology reports both in-state and in the Colorado River system indicate a 2019 winter snowpack that in many cases is well above average. The implications of the Bureau of Reclamation’s recent April 2019 24-Month Study of projections for the 2020 water year (and, as the name implies, the next 24 months) are especially significant. The Bureau updates its projections each month, but the April report and the August report are critical in determining how much water will be released from Lake Powell into Lake Mead in the coming year. The elevation levels forecasted to be in each of those reservoirs at the end of each year trigger those releases. As reported by the Bureau, the improved hydrology allows Lake Powell’s operation this year to shift to a “balancing” release of up to 9.0 million acre-feet into Lake Mead. Signers of the March 19 Letter to Congress urging federal support for the Drought Contingency Plans, with Bureau of Reclamation Commissioner Brenda Burman. From left: Peter Nelson, California; John Entsminger, Nevada; James Eklund, Colorado; Tom Buschatzke, Arizona; Commissioner Burman; John D’Antonio, Jr., New Mexico; Norm Johnson, Utah; and, Pat Tyrrell, Wyoming. Buschatzke, Entsminger and Tyrrell will join the Commissioner before the Senate Subcommittee on Water and Power on March 27. Advocates for the Colorado River Drought Contingency Plans will begin making their case to Congress on Wednesday, March 27, when four officials deeply involved in the effort to stabilize the system are scheduled to address the U.S. Senate Committee on Energy & Natural Resources’ Subcommittee on Water and Power. The witness panel includes Brenda Burman, Commissioner of the U.S. Bureau of Reclamation; Tom Buschatzke, Director of the Arizona Department of Water Resources; John Entsminger, general manager of the Southern Nevada Water Authority; and, Patrick Tyrrell, State Engineer for the State of Wyoming. Like other witnesses, ADWR Director Buschatzke will provide oral and written testimony to the panel about the DCP. Chaired by Sen. Martha McSally of Arizona, the subcommittee will examine the drought plans of the Upper and Lower Basins of the river system. Before the plans can be finalized, Congress must first authorize the Department of the Interior to implement them. Set to convene at 2:30 p.m. EDT (11:30 a.m. Arizona time), The hearing will be webcast live on the committee’s website, and an archived video will be available shortly after the hearing is complete. Witness testimony will be available on the website at the start of the hearing. A final wrap-up meeting of the 40-plus member Steering Committee – the stakeholder group that over the last 8 months debated and negotiated the Intra-Arizona DCP Implementation Plan – is scheduled for Tuesday, February 19 at the Central Arizona Project headquarters. The agenda for the meeting is available at the Lower Basin Drought Contingency Planning websites at both the Arizona Department of Water Resources and the CAP. When: February 19, 2019; 9 a.m. – 11 a.m.
Arizona Governor Doug Ducey is giving over much of his social media platform to getting a Drought Contingency Plan completed in Arizona. The art on the Governor’s Twitter feed home page is one of those startling “bathtub ring” photos of Lake Mead, which depict the reservoir’s dramatic decline in recent years. His official Facebook page includes the same image. The Governor’s Office has emblazoned the Lake Mead photo with a quote from former Arizona Governor Bruce Babbitt, who observed recently that “this is the moment” to get an Arizona DCP agreement through the State Legislature. Ducey has asked lawmakers to act quickly to approve proposed legislation that would give the Director of the Arizona Department of Water Resources authority to enter into a drought plan with the other Colorado River states, as well as the federal government. In December, the Commissioner of the Bureau of Reclamation, Brenda Burman, set a January 31 deadline for states to complete work on their Drought Contingency plans. The Bureau, a division of the Interior Department, is overall manager of the river system. In addition, the Governor’s Office has published video on Twitter of a briefing of Ducey’s proposed budget, which includes funding for the DCP. The briefing, held today in Tucson, includes the graphic copied below, which demonstrates why the drought plan is so vital. Discussion of the DCP funding begins after the 59-minute mark. As depicted in the “Securing Arizona’s Water Future” graphic below, Lake Mead is in jeopardy of falling into a high-risk zone within five years if a system-wide DCP is not in effect. Implementing the DCP, on the other hand, flattens out the curve and gives the Colorado River states time to enact additional drought-fighting measures. How Will AZDCP Fit Into The Colorado River Basin Drought Contingency Plan? While Arizona water managers and affected stakeholders have been meeting almost daily over the past several months to finalize the state’s Drought Contingency Plan (DCP), plans have been underway on a parallel track for several years to ensure the framework is in place for the entire Colorado River Basin DCP. Chronic, often severe drought in the Southwest is seriously straining the Colorado River system. With Lake Powell less than half full and Lake Mead below 40 percent of capacity, the seven Colorado River states are preparing to act should Lake Mead continue falling toward critical surface levels. At the same time, some states – including Arizona – are developing drought contingency plans supporting intrastate needs to contend with future Colorado River shortages. Last week, the U.S. Bureau of Reclamation released drafts of the Upper Basin DCP and Lower Basin DCP documents. This gives the first glimpse at what will be included in the interstate agreement amongst the Upper Basin and Lower Basin states. These documents contain actions that are in addition to the provisions of the existing system-wide agreement, formally known as the Colorado River Interim Guidelines for Lower Basin Shortages and the Coordinated Operations for Lake Powell and Lake Mead. The Upper Basin DCP is designed to: a) protect critical elevations at Lake Powell and help assure continued compliance with the 1922 Colorado River Compact, and b) authorize storage of conserved water in the Upper Basin that could help establish the foundation for a Demand Management Program that may be developed in the future. The Lower Basin DCP is designed to: a) require Arizona, California and Nevada to contribute additional water to Lake Mead storage at predetermined elevations, and b) create additional flexibility to incentivize additional voluntary conservation of water to be stored in Lake Mead. These documents show the interstate framework into which the intrastate (in our case, AZDCP) will fit. AZDCP work continues and we anticipate our intrastate implementation plan and framework will be completed by the end of November, prior to the December Colorado River Water Users Association meeting, at which point the entire plan will come together. For more information on AZDCP, visit ADWR’s website or CAP’s website. The Arizona Department of Water Resources held its annual “Fall Festival” celebration during the lunch hour on Thursday. Needless to say, a fun time was had by all. In addition to caramel apples, cider and (the ubiquitous) hot dogs and popcorn, the Department employees held a pumpkin-decorating contest. Analysts on the scene calculated that, yes, the amount of water in Mark’s pumpkin was approaching… deadpool. The State’s water stakeholders have been engaged for more than two months to craft Arizona’s approach to the Lower Basin Drought Contingency Plan. This effort, led by our two agencies, is directed toward “bending the curve” to protect Lake Mead from falling to critical levels. Recent reports from the U.S. Bureau of Reclamation have stated that the Colorado River Basin has avoided shortage for 2019, but has at least a 50/50 chance of moving into a shortage declaration in 2020. So, will this drought contingency planning effort change that course? Will it keep the basin out of the Tier 1 shortage to be declared at Lake Mead elevation 1075’? The Lower Basin Drought Contingency Plan, or LBDCP, is not designed to keep Lake Mead above the first tier of shortage. Rather, it’s meant to keep Lake Mead from further dropping to the most critical elevation levels, at which point Arizona’s Colorado River water users would be facing deep cuts to their water supplies and the river system would be in extreme stress. The risks to the Colorado River have increased from what was expected when the Interim Guidelines for Lower Basin Shortage were established in 2007. The tools provided in those guidelines now are insufficient to address the current risks to the system. Over the last several years, water users in the Lower Basin states have worked together to voluntarily contribute water to Lake Mead, staving off shortage since 2015. However, after nearly two decades of drought and the recent poor hydrology (meaning little snow in the Upper Basin), a Tier 1 shortage is imminent, even with these increased conservation efforts. Whether it’s in 2020 or a year or two after, that first level of shortage likely will occur, regardless of LBDCP. If not to keep us from shortage, then why is the Lower Basin’s DCP important? One of the most important components lies in the realm of collaboration. By working together, Arizona, California, Nevada, the U.S. Bureau of Reclamation and now Mexico (through the recent treaty update known as Minute 323), we can chart a path forward so one state alone does not feel the brunt of shortage. 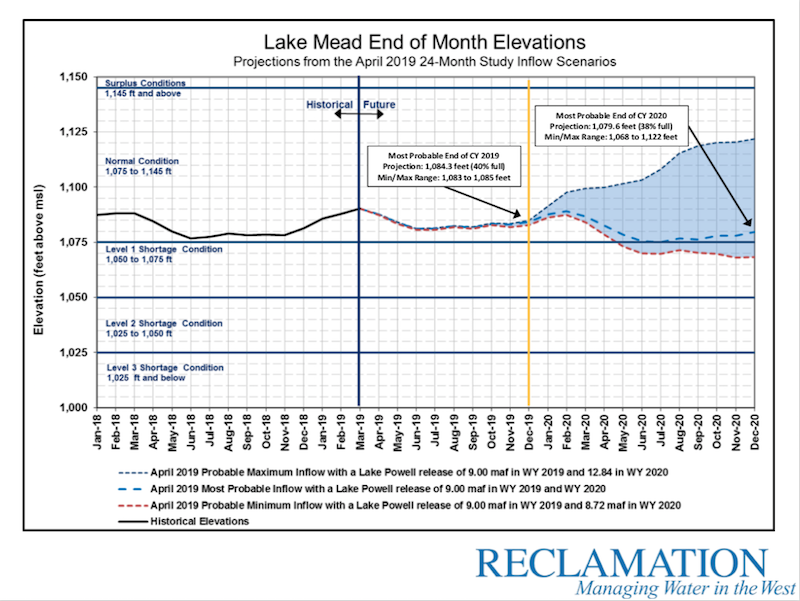 Once LBDCP is in place, we can work in partnership to leave enough water in Lake Mead so the lake begins to recede at a slower level – the “bending of the curve,” which has been rapidly trending downward. It will take some time to get there, but by starting now, there will be more leverage and momentum to prevent the lake from falling to critically low levels. To make this happen sooner, rather than later, we have formed a Steering Committee with representation from a variety of sectors within Arizona. This group has been meeting bi-weekly beginning in late July and likely will continue past Thanksgiving. This “AZDCP” effort includes four essential elements for implementing the LBDCP in Arizona, which the group has begun to work through. The goal is to have a plan in place before the end of the year that would incorporate broad-based agreement within Arizona supporting an effective LBDCP. The State Legislature would then consider the proposal in early 2019 to authorize the State of Arizona to sign the LBDCP. Each public Steering Committee meeting we’ve held has essentially been standing-room only. It’s clear a lot of people believe negotiating an effective Lower Basin Drought Contingency Plan is vital to our State. And each meeting tends to spawn additional meetings with people throughout Arizona working feverishly to get this done – not to keep us out of shortage, but to keep us and the Colorado River system from being in an even worse place. To stay informed, visit www.azwater.gov and www.cap-az.com/AZDCP.